Operating agreements are highly recommended for every established Limited Liability Company (LLC), especially for those comprised of several members; in some states, they are required. The purpose of an operating agreement is to detail and outline an LLC’s financial as well as functional decisions. Such agreements generally include specific language regarding how profits and losses will be handled and distributed as well as how pivotal business decision will handled. Other key information included in operating agreements may include the rights and obligations of each member as well as the process should one or more members decide to leave the LLC. 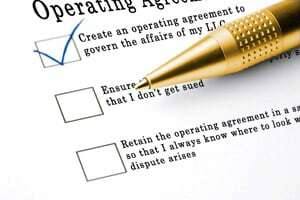 Once signed by all parties, an operating agreement is a legal binding document.